Prior to joining a CSA last spring, my experience with kale was pretty much limited to the bits contained in a bowl of Zuppa Toscana that I indulge in at Olive Garden every so often. So when I found myself with large quantities of this highly nutritious green in my weekly share, I knew it was time to track down some easy recipes. And so I stumbled upon baked kale chips. Site after site raved about how delicious these little gems are, but of course, I was skeptical, as I’m sure many of you are. No, they’re not the most beautiful food to grace this planet – it’s hard to make something that’s crispy and green photograph as mouthwatering – but the taste is simply amazing! Flavorful and crispy, while being chock full beta carotene and vitamins C and K, as well as rich in calcium, this is a snack that you can feel good about serving to your family. 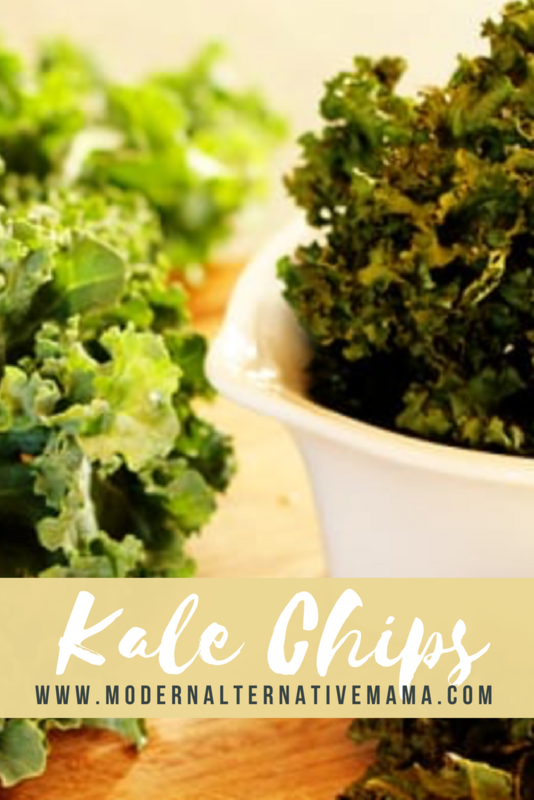 The best part is kale chips are incredibly easy to make. Just pick up a bunch of kale at the store – organic is recommended since kale is on the Dirty Dozen list. Rinse and dry the kale thoroughly. Cut out the tough center rib with a sharp knife and tear into medium size pieces. 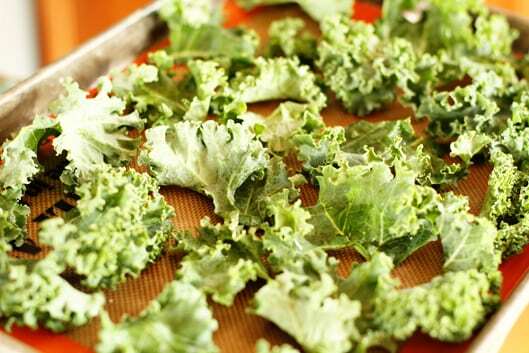 Toss the leaves with the olive oil and arrange in a single layer on a baking sheet. I lined mine with Silpat, but you could use parchment or even skip the liner altogether. Alternatively you could arrange the leaves on your baking sheet and then use a Misto Olive Oil Sprayer to coat them with the olive oil. Sprinkle with salt and bake for approximately 20 minutes or until crisp. 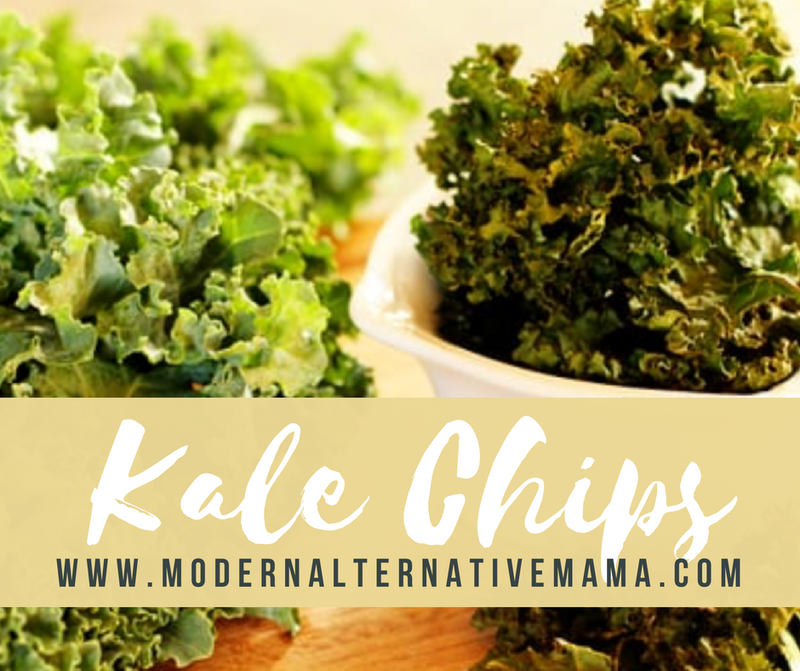 I love my kale chips as is, but you can certainly change them up for variety. Try sprinkling them with a touch of chili powder or cumin or grate some parmesan cheese over top during the last few minutes of baking. The possibilities are endless! Tara Kuczykowski is the lucky mom of three boys and two girls, ages 4 to 10 years – yay for built in kitchen help! You can find her family’s favorite meals and treats on Unsophisticook. We add a little cayenne and garlic powder when we make them…so yummy!